The title “Mother of all driving Routes” in the world probably goes to Route 66 in the United States. Almost everyone knows the name, the scenery and the accompanying song “Get your kicks on Route 66” which was sung by many, including the Stones. Folk from all over the world make the pilgrimage to the US to drive the 2,500 miles from Chicago to Santa Monica in California. The US 66, as the Highway is called, was of importance for those who migrated west and the road supported many communities and businesses it passed and it still does so today. A couple of years ago the North Highland Initiative (NHI) came with their own driving tour to promote the North Highlands of Scotland and to support the many businesses and communities along the route in this remote area. They called their version of Route 66 the North Coast 500, also known as NC500, with start and finish at Inverness Castle. The scenic tour is exactly 516-mile (830 km) long and will take at least two or three days to complete as it covers stretches of single track road as well. The route is as follows: Inverness Castle, the Black Isle, Applecross, Wester Ross, Sutherland, Caithness and along the East Coast back to Inverness Castle. It follows the northern part of our own Scottish Coastal Route which starts in Dumfries and follows the entire west coast of Scotland all the way north to Durness. It’s a great initiative and over these past two years the North Coast 500 already proved to be very popular. A study, carried out by the University of Glasgow Training and Employment Research Unit, estimates the route attracted 29,000 additional visitors and £9 million additional spend in its first year. That’s a very welcome support to this remote part of Scotland. 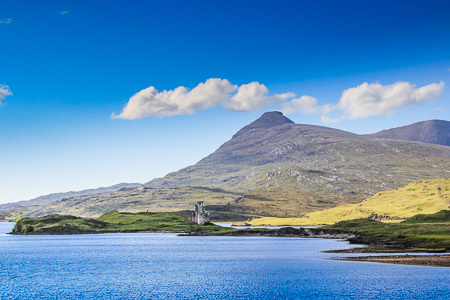 Of course we cover almost the entire NC500 route on our website and we welcome you to check out our many info pages we have covering the far north of Scotland. If you are looking for accommodation along the way we can recommend our Accommodation pages. The map below will help you to online navigate this fascinating area of Scotland. More info on the route is available via this link. We also offer some good advice on road safety, especially where the Single Track Roads are concerned. We wish you a great driving tour!